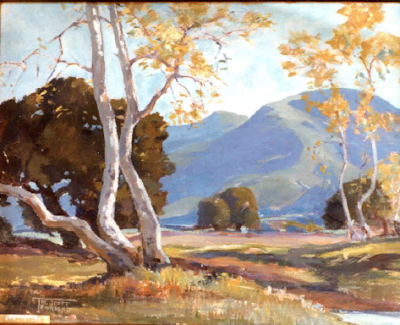 Altadena years painting in the San Gabriels. Born in Illinois, September 13, 1897, Mildred Scott (Townsend) graduated from Northwestern University, studied at the Chicago Art Institute and did graduate work at the University of Wisconsin. In 1921 she married Elmer Scott Townsend. She suffered a tubercular hemorrhage in 1926, then travelled to Southern California where she entered a sanitarium in Monrovia. Her recovery over the next few years was successful. In 1935, the couple moved to the area permanently. Elmer Townsend established a clothing business in Pasadena. 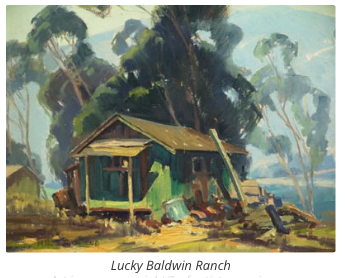 They purchased a home in Altadena at 2677 Highview Avenue where they had a multi-windowed studio built atop the single-story house. it looks like some renovation work just started. As her health continued to improve, Mildred became increasingly active in painting. 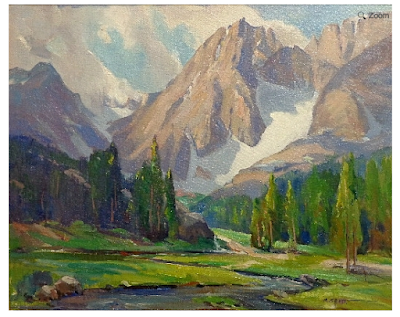 and painted in the High Sierras. In 1953 she studied at the Instituto Allende in San Miguel de Allende, Mexico, painting there and in Guanajuato. In the 1950s, through her studies with Richard Ruben, she moved strongly in to the abstract field. In 1958 she won the Pasadena Society of Artists McBride award and a first award with the Pasadena Art Festival. In 1959 she again won the McBride award and other firsts with the Woman Painters of the West. Between 1958 and 1964 her resume listed 16 awards. 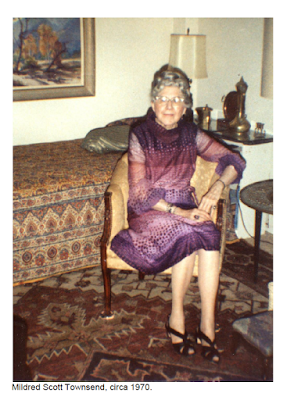 Mildred continued to paint after downsizing to a retirement home in Laguna Hills in 1971. 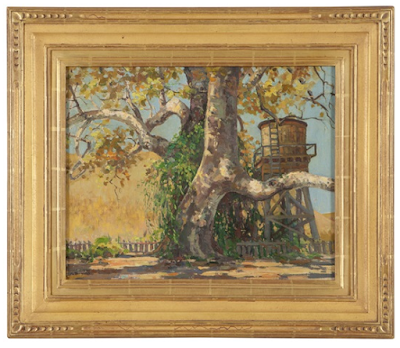 She won a first award at the Laguna Hills Fall Show with a painting that was reproduced on the cover of the January 1973 edition of “Orange County Illustrated” magazine. She died January 29, 1985. Mildred in Laguna Hills, about 1970. Note her painting "Hasting's Ranch"
is on wall to her right. Twenty-five of Mildred Scott Townsend’s abstracts, many of them award winners, are housed at the Bower Museum in Santa Ana.